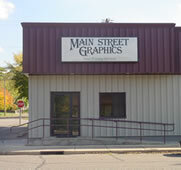 Main Street Graphics, Inc., is located on Main Street in Durand, Wisconsin on the banks of the beautiful Chippewa River. Our modern facility allows us to climate control all of our products to insure top quality. Our experienced and dedicated staff is committed to excellence in the printing industry. The pride they have for the work they do is reflected in the final product we deliver to you. Contact us for more information and price estimates on your printing needs.